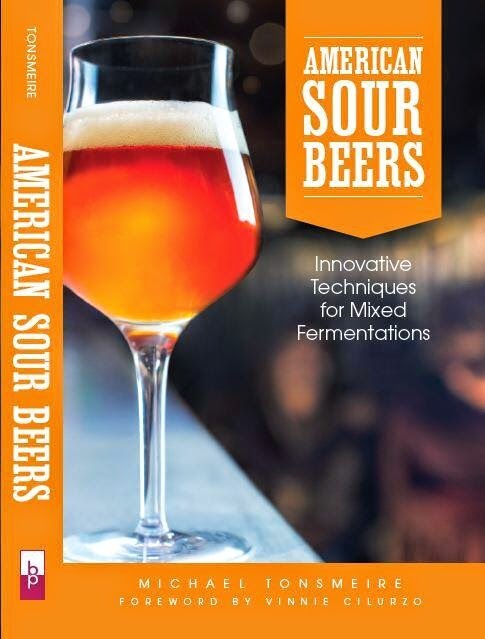 American Sour Beers Book Tour! While shopping for beer a few months ago, I tried a sample of Fernlands Sauvignon Blanc 2013 (from Marlborough, NZ). The idea immediately struck me to add the wine's citrusy flavors to a hoppy/tart/funky saison. In addition to a yeast blend harvested from ‘Merican Saison, I pitched Wyeast’s Lactobacillus brevis. Given the heightened IBUs I wasn’t expecting sharp acidity, but I wanted some tartness to enhance the grapefruit and lime. This was far from my first time combining wine to beer, for example a variant of my first Pizza Port Mo’ Betta Bretta clone was mixed with cherries rehydrated in Pinot Noir, a Russian River Temptation clone with Chardonnay, and my trials blending Oud Beersel Gueuze with Maison Trimbach Riesling. The quality of wine you can procure is usually better than the wine grapes you can source locally, and if nothing else combining them is a much simpler task. Mixing wine into a batch of commercial beer isn’t allowed (which is why breweries tend to turn to wine barrels and grapes); you have to appreciate the legal freedom homebrewing allows! When the base saison was finished dry hopping, I blended a sample with measured amounts of the wine for evaluation. I could have stood for adding more than 750 mL (~4.3% of the batch) of wine to the keg, I should have bought two bottles! The New Zealand saison is keg conditioning to boost the Brett activity without extended aging that might compromise the vibrant hop aroma. The second runnings from it were turned into a Berliner weisse that will be receiving some citrus, most likely lemon, eventually. More on that batch later! 1.00 oz. Rakau (Pellet, 11.00% AA) @ 30 min. 2.00 oz. Motueka (Pellet, 12.00% AA) @ 0 min. 2.00 oz. Nelson Sauvin (Pellet, 12.00% AA) @ 0 min. Added 3 g of CaCl and 1 tsp of 10% phosphoric acid to the mash (along with a couple handfuls of rice hulls. Same treatment for the 170 F sparge water. Lemon Berliner - Brought just to a boil, added yeast nutrient, chilled to 85F, pitched Lacto, added 7.5 g of 88% lactic acid (aiming for 4.5 pH), left at 65F to ferment. OG 1.030. L. brevis and Saison Brett dregs for the first 24 hours - activity by 12 hours, then US-05 (11 g, not rehydrated) (down to 1.024 at that point). 7/30/14 Both batches moved to ~75F ambient after three days to ensure complete fermentation. 8/7/14 Dry hopped saison portion. 8/17/14 Kegged the saison (1.008, 87% AA, 7.1% ABV. Light acidity, nice hop aroma) with ~750 ml of Fernlands 2013 Sauvignon Blanc and 3.5 oz of table sugar. Flushed keg twice before and after filling. Left at ambient basement to condition for a couple weeks before tapping. 7.3% ABV including the wine. 10/29/14 Tasting notes. Not much I'd change, delicious blend of citrus and funk, from the hops, wine, and Brett. What do you think of the Lactobacillus Brevis from Wyeast? I saw it at my LHBS and was tempted to get it for a Berliner Weiss brew. I normally just culture one up from milled grain. I really enjoy L. Brevis versus the normally used L. Delbrueckii. I have cultured it from probiotic yogurt and used commercial pitches from White Labs and compared to Delbrueckii, Brevis has a nicer aroma and a more pronounced tartness. I also find it lowers pH much faster than Delbrueckii. From page on 374 there are more non Sacch. yeasts that can be of use to us. Just picked up a copy of your book and skimmed it, btw- looks great. I can't wait to really get into it soon. One thing I'm having trouble understanding. When I brewed a Berliner Weiss with a homemade lacto starter, I read I had to keep the IBUs very low because the lacto doesn't do well in a high IBU environment. But then with this saison, which sounds great, you would be adding lacto in a 38 IBU beer. Do the lacto just not sour as quickly, or how do they do well in that environment? I'm just getting into sour beers, and learned a lot from reading ASB, but I don't understand this. Anyone have any insight? Hopefully glycosides and Beta-glucosidase that more specifics will be available from both sides (hops and Brett)! L. brevis is more alpha acid tolerant than most Lactobacillus strains, but 35 IBUs was enough to hold it in check. With a firm bitterness I really didn't want a huge amount of acidity anyway. As the pH drops the inhibitory ability of hops increases, so even if you see a strong start from Lacto, the hops could stall it as it produces acid. Interesed to see where this one ended up; I have a replacement pH meter in the mail, my old one crapped out a few weeks ago. Why did you lower the pH to 4.5 before pitching the brevis? Did this have anything to do with head retention? I have some friends brewing berliner weisse commercially and they have read that pitching the lacto at a pH below 4.8 will help preserve head retention. I do not have a scientific source, however. I talk about it in American Sour Beers, lowering the pH before pitching Lacto helps to reduce the protein degradation (protecting head retention). Which Brett strain did you add to get the β-glucosidase activity? From reading through various sources, it seems B. custersii is the preferred strain, but this is not commercially available it seems. Would both of the White Labs isolates work (bruxellensis and bruxellensis trois)? Your book also mentions claussenii works? That is really the issue, I'm not aware of the list the correlates the research done with actual commercially available strains... As I suggest in the book, if you are counting on beta-glucosidase activity pitch a few strains! I was afraid you were going to say that! I've decided on a 100% brett pitch with a tube each of clausenii and bruxellensis trois, so we'll see what happens. does the addition of lactic to lower the PH "cheat" the acidity at all? or is it nominal, so the acidity is only noticeable from the lacto. My goal was to add enough lactic acid to get the pH to 4.5 pre-fermentation, this is actually higher than most clean beers. Because pH is a logarithmic scale, it shouldn't have a huge impact on the final flavor. Luckily a new pH meter just showed up, so I'll take a reading when I do the tasting. When pitching brett in the keg, are there any extra cleaning/sanitation precautions you take to the keg/beer lines? I have separate kegs, fittings, beer line, and tap for my sour/funky beers. There are just too many places for nasty microbes to hide for me to feel safe sharing that equipment. I don't even hook up my sour gear to the keg washer I use for clean beer kegs! Love the blog, and cool to see the Sauv Blanc brew - how did it turn out? I thought you might be interested in a beer we brew. We're in a pretty fortunate position being a New Zealand brewery, and located close to a wine region. We've brewed a beer for two harvests now called 'Sauvin Nouveau' that is a heavily Nelson Sauvin hopped pilsner that we co-ferment with freshly crushed Sauvignon Blanc juice at time of the harvest. It's incredible how much aroma carries through - Sauvin and Sauvignon are very closely related! Sounds like a delicious beer! I'd use fresh juice or must if I could get it, but living in America the wine is much easier to come by. This batch is doing well, should have tasting notes up in the next week or two. Great stuff! I'm going to be writing an article about glycosides for BYO in a few months too, should be interesting to really dig deep into. I'm giving this a shot this weekend, but with 8 oz. Galaxy hops (maybe an oz. or so of Nelson Sauvin) and Australian Chardonnay (stole your idea!) - just want to make sure I understand what you did. You used the Brett/saison yeast from your last saison, and pitched 0.5 L of lacto in both this saison and your Berliner? I assume you didn't decant the starter, since lacto isn't very flocculant? So you pitched the lacto around 110F and left at ambient to give it a 6 hour head start, then you pitched the Brett/saison yeast when you were around 65F? Correct, although more because of the situation than anything. Honestly with so many IBUs I doubt the Lacto was active at all. You could leave it out and still have a great beer. Best of luck! This New Zealand Saison Recipe turnout to be my best Saison I ever brewed. I have brewed about 6 different Saisons from BCS and Drew Beachum AHA posts. This was my first Saison I was going to be brave enough to but Brett in ( only half the batch got brett due to my newbie fear of brett). I split a five gallon batch with one getting Wyeast PC3031 French Saison and Brett C while the other got Wyeast 3711. The wine was added at bottling 1 in 20 wine to beer ratio. The Brett version was way better. The brett seemed to meld the flavors together seemlessily while the none brett version was okay but the beer and wine flavors were two separate flavors and not as harmoniously supporting each other. I bottled the clean/non-brett version 4 weeks after brew day and the brett version 8 weeks after brew day. The Brett version also had a way better shelf life. The non brett version flavor started to fall off after 10 weeks were as the brett version held up for 6 months. Plan to use brett in most of my Saisons going forward. Better taste and Shelf life. I been using Brett C to avoid too much funk. Blvd Brewing Brett Saison can get a poopy smell (taste is fine but the smell still is off putting)after a year I am trying to avoid. What would be another Brett strain to try that is on the milder side but more funky than Brett C? Cheers! Brett is a terrific oxygen scavenger, it also seems to make hop aromatics linger without dropping off a cliff.